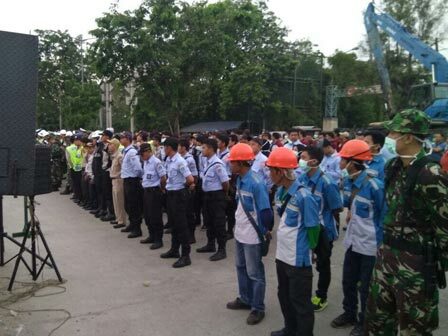 300 illegal buildings in the BMW Park, Papanggo Urban Village, Tanjung Priok Sub-district, North Jakarta were demolished by 1,509 joint personnel. As planned, the land would be used as a stadium.
" We demolish hundreds of homes here to smoothen stadium development at the BMW Park"
North Jakarta Mayor, Husen Murad disclosed that prior to demolishment, his party had done socialization about demolishment plan to local people, including sending the first-third warning letter. "We demolish hundreds of homes here to smoothen stadium development at the BMW Park," he expressed, Tuesday (8/1). He also urged the all apparatuses to control those buildings humanly. "Do it humanly without arrogant," he stated. In the meantime, North Jakarta Metro Resort Police Chief, Com. Pol. Dwiyono added, he led the demolishment process to avoid unwanted things. "All goes smoothly, as local people have left their home before we do demolishment," he closed.